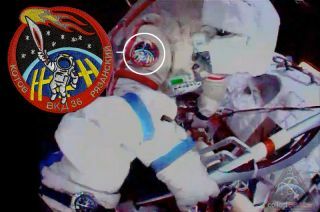 Cosomonaut Oleg Kotov can be seen wearing artist Luc van den Abeelen's Olympic torch patch while holding the real Sochi torch on a spacewalk outside the International Space Station, Nov. 9, 2013. The two cosmonauts who took an Olympic torch on a spacewalk outside of the International Space Station Saturday (Nov. 9) carried out the symbolic relay wearing a surprise space mission patch depicting the icon of the 2014 Winter Games. Oleg Kotov and Sergey Ryazanskiy with Russia's federal space agency Roscosmos each donned Orlan spacesuits adorned with the previously unseen embroidered emblem, which, like the Olympic Games, came as the result of an international effort. The orbital Olympic torch relay served as an extension of the traditional Olympic flame relay now a month underway in Russia. Kotov and Ryazanskiy took turns posing with the unlit torch, which was returned to Earth on Sunday night (Nov. 10) to be used during the opening ceremonies for the 22nd Winter Games on Feb. 7 in Sochi, Russia. According to van den Abeelen, he designed the spacewalk patch to include a simplified depiction of the International Space Station and nine stars for the nine Expedition 37 crew members who were at the orbiting outpost at the time of the time of the extravehicular activity. Included in that count were the two spacewalkers, the three flight engineers who launched with the torch Wednesday (Nov. 6) and the three departing crewmates who landed with the torch on Sunday night. "The stars are shaped like snow crystals — a reference to the Winter Olympics," van den Abeelen added. As for the red and silver torch, the insignia represents the Olympic flame with a celestial object. "The Sochi 2014 torch is topped by a flame shaped like a comet, for ISON (C/2012 S1)," van den Abeelen said. The sun-grazing comet was at one time predicted to be one of the brightest ever seen, "though it now seems this will not look as spectacular as depicted in the patch," he said. As the torch is an official symbol of the Olympic Games, the patch needed the approval of the Sochi 2014 Olympic Organizing Committee before it could be cleared to fly. "I also sketched a version [of the emblem] with a classic Greek torch, but in the end, Roscosmos got the okay from the Russian Olympic Committee for using the Sochi torch in the design," van den Abeelen wrote. As it happened, another surprise patch featuring the torch was also launched to the station, though in a less official capacity. Artist Blake Dumesnil collaborated with NASA astronauts Michael Hopkins and Rick Mastracchio to create a patch commemorating the brief period when the torch — and its nine supporting crew members — were at the orbiting lab. The "Expedition 37.5" emblem, which Dumesnil described as "official unofficial," was not worn during the outer space torch relay but was hung inside the space station, affixed above a hatchway. "It's not an official [patch], but more an acknowledgement of a unique handover between crews," Dumesnil described on Facebook. The Sochi 2014 torch was the third Olympic torch to fly in space. Space shuttle missions in 1996 and 2000 also took unlit torches to space, although they remained inside their spacecraft for the entire flight. The Sochi 2014 torch was the first to be taken outside on a spacewalk. Click through to collectSPACE.com to see a larger version of the Olympic torch spacewalk patch, as well as the "official unofficial" Expedition 37.5 mission patch.